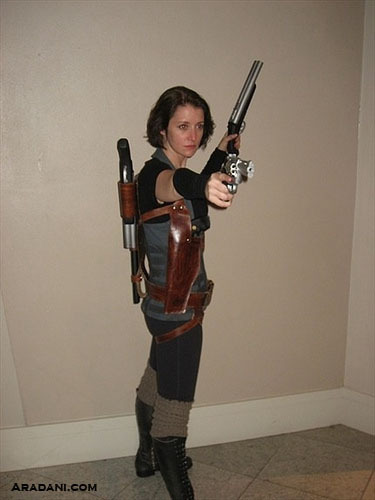 This Alice bodice from resident evil is such a cool costume piece. You can also use it for other costumes if you change the color of the fabric as you can see in the image below. This was a special request for the bodice in black. 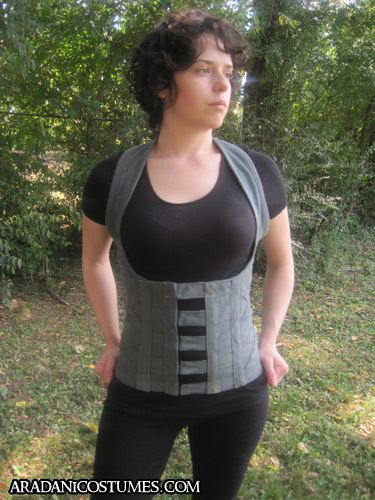 This is our friend Jen who requested the first Alice bodice from us. She displayed this bodice along with the rest of the costume at Dragon*Con 2010. The pattern was not too hard to develop for this costume. I just draped the basic shape on to my body form using a few pieces of muslin. The harder part was trying to figure out where the Alice bodice was supposed to sit under the bustline. Once that was resolved, it was pretty basic bodice pattern. I also had to take into account the extra two inches for the front closures. 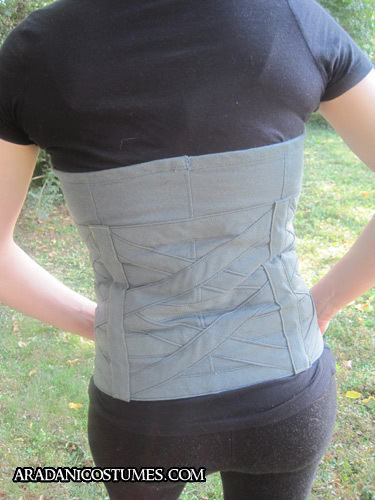 The fabric that I used for the Alice bodice was originally a light gray duck cloth. I took the cloth and dyed it a light teal in the washer. It actually took two sessions of dying to get just the right color. After that, I carefully ironed the fabric out and cut out my pattern pieces. Once they were all sewn together, I had to figure out what I was going to do about making the front closures and finishing the edges. I needed to make some binding, so I cut out bias strips of the fabric and pressed it together. I think the binding was the most time consuming part of the project, because that was the main decorative feature. 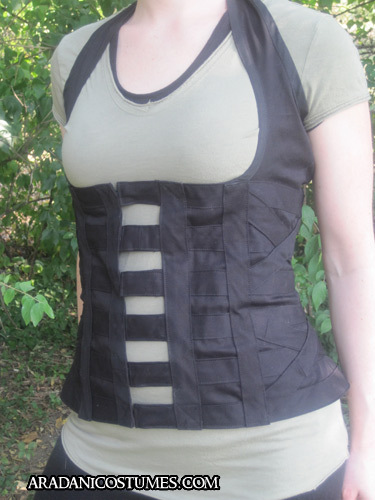 The Alice bodice began coming together when I added the horizontal strips around the mid-section. And then, when I added the x’s in three different places, it really started to look like a Resident Evil Afterlife style Alice bodice. The icing on the cake is definitely the hook and eye closures in the front using the two inch strips of bias fabric and the yellow decorative stitching. The leather was put together by our friend Derek Deweese. 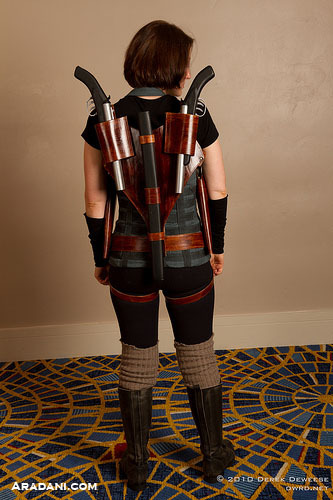 He did such a great job with the holster and the images taken at Dragon*Con! I want to thank Jen for being the first one to purchase this bodice and for making an awesome Alice to cosplay at Dragon*Con! If you have any suggestions or questions, please visit our contact page. This looks beautiful, Laura – great work! Will you be around this weekend? I was going to go retrieve the velvet cloak fabric from the cleaners tomorrow……see if it will work or not.